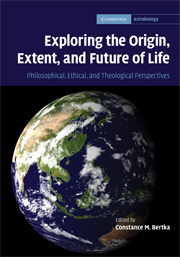 Exploring the Origin, Extent and Future of Life, edited by Constance M. Bertka, is the result of a series of workshops spanning two years and supported by the AAAS Program of Dialogue on Science, Ethics and Religion. Incorporating work from seventeen collaborators from the wide ranging fields of science, theology, ethics and philosophy, the book deals with three major themes central to astrobiology: the origin of life on Earth and in the universe, the extent of that life in the universe, and the future of terrestrial life as it seeks to colonise the solar system. Split into three sections to deal sequentially with these central themes, each section begins with a scientific introduction and then follows a historical, theological and philosophical discussion on that theme. In ‘Origin of Life’, we are introduced to the supposed mechanisms for the emergence of life and the current experimental pursuit of it, before learning of the history of thinking and several modern Christian perspectives. Discussion here presents insights into the nature of scientific thinking as a whole, as well as its application to astrobiology. The section ‘Extent of Life’, goes into some depth describing how life may survive in non-terrestrial habitats, as well as how modern astrobiologists go about searching for life in the galaxy. Once again, the history of the search for extra terrestrial life is presented before the authors consider the ethics and implications, to both society and religion, of finding life outside of Earth. In the final section, ‘Future of Life’, the contributors discuss the practicalities as well as the ethical and philosophical dilemmas that face potential future attempts at ‘planetary ecosynthesis’, most notably, the terraforming of Mars to make it habitable for humans. The discussion in this section offers valuable ethical perspectives from both atheist and religious points of view and essentially provides a philosophical framework from which current and future astrobiologists may work. Written for a principally American audience, the introductory statistics and much of the theological perspectives are necessarily more Christian-focussed. However, this does provide a very useful springboard to confronting the issues between science and religion that many see as irreconcilable. The in-depth discussion presented in the book presents many perspectives, from fourth century Augustine, Bishop of Hippo, to the late astrophysicist Carl Sagan. Such a wide range of viewpoints offers insight into how different approaches can influence the study of life on Earth and in the universe. One important question that comes to mind with this volume is the target audience. Is it intended for a scientific specialist, or a trained philosopher or theologian? From a scientific point of view, some of the philosophical arguments become too involved and self-referential, especially with regard to the origin of life. On the other hand, it is possible that a philosopher or theologian seeking to reconcile beliefs and ethics with the practical searches for xenobiology would require more scientific background than is offered within this volume. However, the text is extensively referenced with footnotes and further reading throughout, allowing a reader from any discipline to further research any topic touched upon. In summary, this volume is the product of a largely unprecedented and laudable collaboration between scientific and philosophical disciplines in approaching the growing field of astrobiology. Regardless of the reader’s specialisation, this is an important ‘turn-to’ book for academic discussion on the inevitable philosophical, ethical and religious questions surrounding the search for life in the universe.